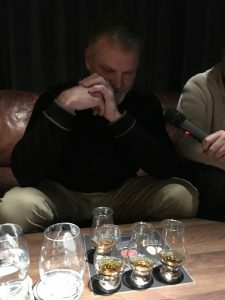 Yesterday, Jeff Arnett, Master Distiller of Jack Daniel’s whiskies, walked me and a satellite radio announcer through a flight of his company’s six most lauded offerings. We were scheduled for about 45 to 60 minutes. But we ended up chin-wagging our way through two detailed hours in the sort of dark bar you’d expect from this brand. Among a distiller’s essential skills is a gifted tongue, not just for tasting and assessing but for storytelling. Here are just a few of the interesting things we learned. One: All bourbon is American whiskey but not every American whiskey is bourbon. Let’s back up to explain: Any whiskey — and that’s whisky without the e in Scotland — is simply spirit produced from distilled grains, be they barley, rye or corn and even rice. So, there are sub-varieties of this liquor not just in the spelling of the word. By law, bourbon must be made in the USA (one of the actual 50 states, so f**# you, Guam!) and from a minimum of 51% corn mash. 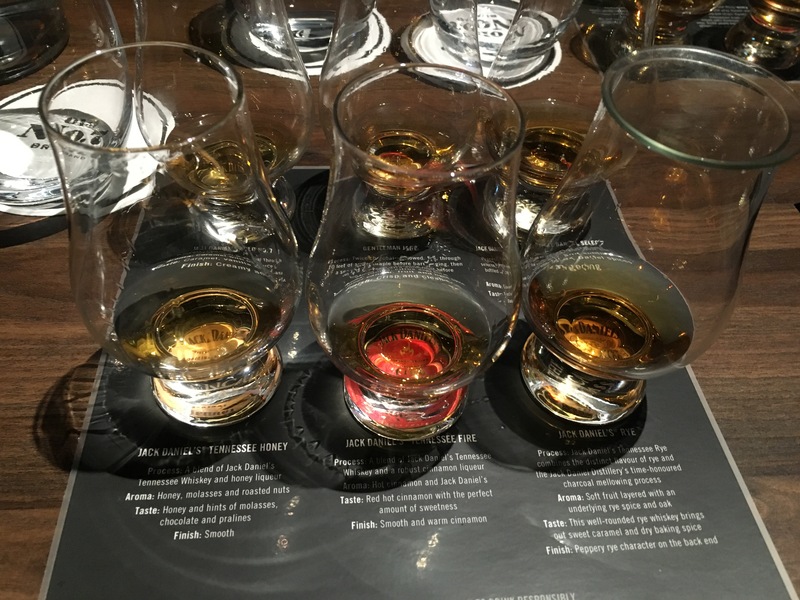 There are other bourbon peculiarities but those ones are the biggies. Two: If you love bourbon, you probably have a sweet tooth. Why? Well, corn has more sugar than, say, rye, registering on a different part of the tongue. So, if you love rye? Your preferences are probably towards spicier tastes. Rye features a peppery assault versus bourbon’s caramel sweetness. And if you love both bourbon and rye? Congratulations. You may have a drinking problem. Three: Arnett says Old No. 7 could be bourbon. Yes, No. 7. It’s that notorious Jack Daniel’s logo you’ve seen tattooed on people like the Møtlëy Crüé drummer in his wedding night video and it just MAY be bourbon, though many people say it ain’t. Arnett flashes a cheeky smile while arguing his point. No. 7 is made in the USA and satisfies the legal minimum content of 51% corn mash. Hence, maybe it’s bourbon (see One above). What sets it apart, he says, is this liquid’s drip-filtering process through ten feet (just over three of our Canadian metres!) of sugar maple charcoal. So, like some proud papa, he seems to see this drink as bourbon and something more. A sort of bourbon with benefits, or baggage, or a diverting war story. Four: Nobody knows why No. 7 is what the original Jack Daniel named his original product. Seems he was a gentleman of some mystery. Nonetheless, seven still figures prominently in the company’s legend and culture. Example? Our private interview with Arnett was at a secret location in downtown Toronto which we’re not at liberty to share (why do so? keep in mind, bourbon is made in the USA where it’s your constitutional right to pack heat, plus the burg this product is produced in is actually called Lynchburg). The secret bar is called Jack Daniel’s Room No. 7 and I had to knock seven times on a plain steel door down a generic lane to gain entrance. Six: Since the original Jack Daniel left Room No 7 to join the Angel’s Portion in the sky, there were only five master distillers until our host Arnett took over. That’s a total of seven in since 1866. Seven: The company has produced all its whiskeys in the same spot since 1884 with water that falls into in a cool hollow on their property. Which leads naturally to the question: just WTF is a hollow anyway? Eight: Though not unique to the South, a ‘hollow’ is a topographical quirk many of us THINK we can define because we read Huckleberry Finn in grade seven. In fact, a hollow is a small valley that tapers to a point, like the space left behind after removing a single slice of Southern key lime pie. Nine: In 1947 clearly unwoke entertainer Jackie Gleason introduced the not-much-more woke Frank Sinatra to Jack Daniel’s No. 7. Frank and Jack (No. 7, not Gleason) were rarely apart thereafter. Indeed in 1955, Sinatra allegedly tippled a rocks glass full of JD in front of an audience and dubbed it “the nectar of the gods.” Wow, that really puts horns of mead, flagons of frothy ale and amphorae of temple wine in their place! Today, such an endorsement would be like Beyonce and Drake hooking up with several Kardashians but imagine them doing it unsolicited and continue reading after you stop laughing in a few minutes. Sales skyrocketed and it took the nectar’s producer took over a decade to catch up with customer demand. After all, you can’t instantly purvey twice as much of a product that takes at least four years to make. Well not here anyway. Ten: According to Arnett, the popularity of bourbon arose due to the sweet tooth of the American public. Before its invention, American whiskeys were largely ryes. But times and tastes change. You’ve probably noticed how hip gins, vodkas and ryes have become over the past decade. Here in Ontario, it may be the law that producers of rye are required grow Victorian strong man beards and wear flannel shirts. 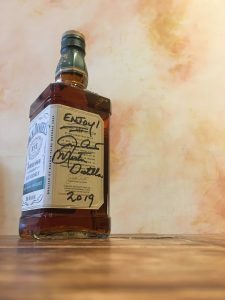 A tad late to the party, Arnett and company did release a single-barrel rye whiskey in 2015 and what he calls a Tennessee Rye in 2017. He notes how most ryes are distilled from as much as a 95% rye mash. 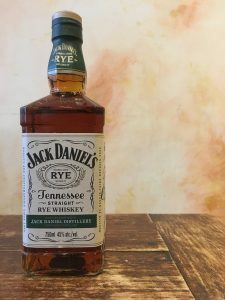 To set theirs apart and perhaps lure rye-wary JD fans, Arnett composed theirs of 70% rye, 18% corn and 12% barley. For a touch of sweetness. Speaking of sweet, at the end of our conversation, he signed and gave me a bottle. Bonus Eleven: Arnett’s signature surely increases this unopened rye’s collectability and value (not that I’ve floated it on eBay) but I’m sorely tempted to crack open and empty it right now.